This week I passed the professional exams and there is one thing which helped me very much in this deal. It is IPad and a very useful program” Good Reader”. Probably the technic of using this tool might be interesting for readers and I decided to dedicate to it this post. 2.	skills of work with pdf-files. 1.) When customers manage their files in the cloud. A very good example is Google Drive. 2.) When synchronization organize without customers. One great example of it is photo synchronization from Apple between IPad, IPhone, IMac. 3.) And “intellectual synchronization” (my term) as we have in Good Reader. 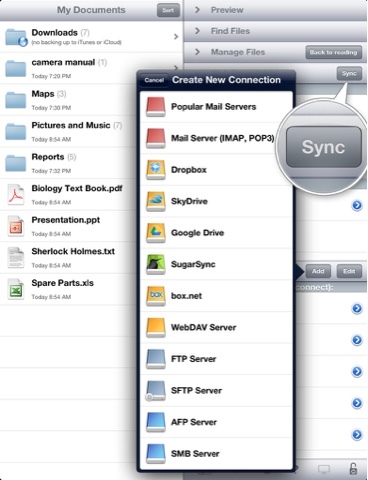 We can link Good Reader on the tablet with accounts on cloud services as Google Drive, Dropbox etc. We can see on the picture that the tablet program can be linked with several accounts. When we click on the button “synchronization”, all files inside folders synchronize with relevant folders on Google Drive. Pdf-files are the most suitable format because it gives possibilities to highlight letters, add bookmarks and comments. I especially like searching feature there. If I didn’t have gadget, I would carry a very big suitcase with Study Books and Study Notes and technic of work wasn’t perfect. I refer 50% success in passing exams to the features of this technology and recommend to use it.